Some flex is good, but IME, most skate shoes feel like soggy waffles under your feet. I rode bmx for years, and I always had a hard time finding sneakers with moderately stiff, thick soles. I had some Ipaths that lasted me for 4 years of bmx abuse. Nothing else ever came close. I can't. Fused ankle means I always end up with my heel on the pedal. Super annoying. In a reversal of my previous stance on flat pedals, I have been riding Chromag Contacts (big platforms) and Giro Jacket sneakers full-time for the past few months on chunky trails. I lost some of the power and control that I had with SPDs, but I have gained a ton of confidence as I can hop off the bike more easily when needed. I have learned to habitually drop my heels for braking and descents, something I didn't do at all previously. my legs are happier (except for the occasional bloody shin) and riding the bike is more fun. I admit part of the fun is smoking a bunch of people clipped into their FS crabon bikes with my rigid singlespeed on flat pedals. there is a learning curve to riding flats, but it's worth it. it makes you a better rider as you learn to center your weight on the bike. when it comes time to "session" a spot, you don't have to faff about with trying to clip in before tacking a boulder or a drop, just stomp on the pedal and go. on that note, my Chromags are great pedals, but the axle has some play in it. the "axle kit" that should fix this is $40. the puts me half-way to the cost of some decent new pedals, so I might go for something new. what are your favorite sub-$100 pedals right now? I just saw the new XT m8040 flat pedals and they look really nice for $80. cone-and-cone bearings FTW! Anything else you recommend based on experience? also, shoes. Five Ten Freeriders are the reigning champs but are $150 most places, and Afton might give them a run for their money for $100. I would like to try some Vans for less than $50 though. My Giro Jackets are on borrowed time. I'm rolling Saints on my fat bike and have no interest in trying anything else. Buying a pair for my 29er after I get its fork rehabbed. For shoes, Scarpa Cruxes like Joe's, about a hundred bucks and the right amount of stiffness for me. I'm rolling Saints on my fat bike and have no interest in trying anything else. new Saints or old ones? The old ones were pretty darn nice for a trail pedal, but the new ones seem like overkill. I wish the new XTs were a little thinner but they look good otherwise. 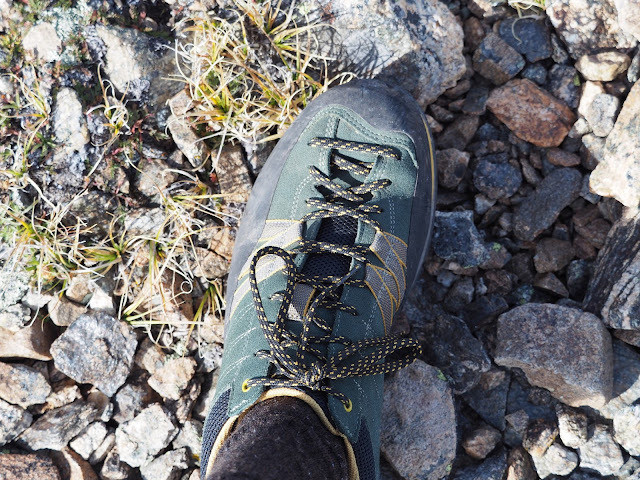 The sole of those Scarps don't look ideal for sticking to a flat pedal, but I'll take a look at a hiking shoe like that. I'd like to find something that fits like a Merrell trail runner but with a durable, relatively flat sole. and less than $100. Old ones - was it PD MX-80? I think the new GR-500 is the old Saint body and nicely priced. Stickyness seems ok to me - I'm fighting some chronic tendinitis in the bottom of my foot and need a little extra stiffness and stability, the Scarpas seem to do this well. I'm only using the short pins in my pedals anyway so if I need more traction I can get it. Since I'm back to being a ... what's the equivalent MTB term for "roadie"? MTB'er? Fat Tire'r? Mountie? I've thought about switching to flat pedals because I know it will help me learn to be a better rider. I'm casing out some of the hard drops before riding them and here there's never a lot of run-up room and there's the moment of panic when I'm not quite clipped in and start rolling down. It's just hard to make that leap because I do pull up on my pedals quite a bit when going up over roots and moving the bike around. It's just hard to make that leap because I do pull up on my pedals quite a bit when going up over roots and moving the bike around. You will unlearn those habits quickly and become a better rider as a result. no more "cheating" with the pedals. you'll learn how to execute a proper bunnyhop, and after that, your timing and upper-body strength will be the only thing holding you back from awesomeness. your timing and upper-body strength will be the only thing holding you back from awesomeness. Switched to flats 2 months ago. FiveTen Contact Pro shoes and OneUp composite pedals. So much more confident on techy stuff. Great on the steeps and in the air. Just as good as being clipped in on climbs. I like it so much I fun the same set up on my gravel bike. Yeah Chase! I picked up 5.10 Pro's as well. I really cannot see myself going back for any reason. A few times a year you can find deals on Five Tens. I got a pair of Freeriders (base model) about a month ago for about $80. Way stickier than the Giro Jackets which is what I had before. I had worn a lot of the rubber nubbins off the bottom of the Giros as they seemed to be harder rubber than the bottoms of the Five Tens. A few times a year you can find deals on Five Tens. I will have to keep checking the retailers, but it looks like things have changed since Adidas bought them. they don't have the same cool deals on the Five Ten site anymore. A rare time when brick and mortar is cheaper is those shoes. Check your local shop, I got mine at a shop in Moab for $100! I keep seeing flat pedals getting bigger and bigger. I understand why thinner is better, but is there a point were a pedal is bigger than necessary for your shoe size? I where a size 43 or about 9-1/2 and my shoes usually don't make contact with all of the surface of my Chromag Contacts because the pedal is so big. Yeah but when your shoes start slipping/moving around on the pedal, bigger is better! The double edge sword of course is that more aggressive pedals have better grip, and you're much less likely to get pedal bite, but if you do slip a pedal - may God have mercy on your soul!!! Here's a secret: don't smash your shins into your pedals. Its more fun that way. Riding BMX for almost two decades taught me to get my shins out of the way. I have the scars, mental and physical, to show for it. It can still happen, but you learn to instictually keep your shins away from the pedals when they come flyin. Cheap, tall alu BMX pedals with molded pins were the worst. It's like kitchen knives, in that a sharp knife is safer because it's more likely to make a clean cut through whatever you are trying to cut instead of getting jammed and chomp your finger instead. Sharp pedals are more likely to stick to your shoes instead of slipping off and biting your shin.